There was a time when the Best Off Road Hoverboards were still the very much science fiction territory. Just think about how improbable for someone from the 90s to even imagine such a means of transportation. And then 2013 happened. The world was introduced to the self-balancing scooter or better known as the Hoverboard. The first products were experimental at best, bought by early adopters for its novelty rather than something that they see using. Four years after American businessman Shane Chen filed the patent for the Hoverboard, it seems that the world has continued to fall in love with this futuristic scooter. Thousands of people use it and you can buy one online quite easily. The future is now. With so many models for sale, picking the right hoverboard for you might be a little daunting at first. To help you, we’ve listed five hoverboards that you should definitely check out. This is by far the biggest Swagtron hoverboard currently on the market. It is also the first in the world to handle up to 250 pounds. 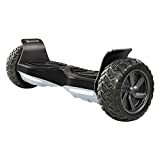 Furthermore, the Swagtron T6 is equipped with 10-inch inflatable rubber tires with mounted aluminum rims. The unit is powered by two 350W motors that are a bit weaker than some of the Swagtron’s competitors. The maximum speed is clocked at 8mph with a maximum driving range of 12 miles. A relatively new player in the hoverboard arena, reviewers all over the Internet have sung the praises of EPIKGO since it was first released in 2016. And with good reason. 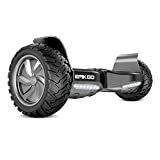 Most of the common issues that plagued previous generations of hoverboards have finally been addressed by the EPIKGO. Larger, sturdier, and more powerful than many other models, this self-balancing scooter has 400W dual motors powering it. Furthermore, it is geared for the outdoors, with large 8.5-inch wheels that can handle all kinds of terrain and an IP56 rating. With its speed reaching 12mph, the GT8 by GT Hover is one of the fastest hoverboards available on the market today. The 800W of power coupled with the All-Terrain 8.5-inch wheels is perfect for off-road trips and other challenging tracks. Also, the mobile app that GT Hover provides is easy to configure. With large shock-absorbent and solid rubber tires, you can figuratively go anywhere using the HBX-AT hoverboard. The IP56 rating also helps with the water resistance. Like the other hoverboards included here, it can reach 10 miles on a single charge. Furthermore, the bundled app can set the speed settings of the hoverboard, you can also track your routes and your speed. The first thing that you’ll notice about the Vecaro TREK-X is its real camo cover which quickly establishes that this model is very suitable for off-road adventures. The 8.5-inch wheels with rubber tires and black aluminum rims are perfect for tough terrains. The built-in Bluetooth speakers and the integrated LED headlights are added bonuses as well. The mobile app can configure controls such as speed, force, steering sensitivity, and beginner/advanced riding modes. As always, the choice remains with you. We’ve made your decision-making process easier for you since we’ve narrowed down your choices into five. The only thing you should do is keep in mind the important things to check before buying your first hoverboard. These are speed, battery life, the size of tires, weight capacity, special features, and of course, the price range. Speed is important; however, you should keep in mind that the top speed is around 10mph or less depending on the hoverboard that you’ll use. That is still a huge jump considering that the average person walks at around 3mph, a swift jog is at 6mph, and the average running pace is at 8mph. For battery life, the most that you can get on the hoverboards that are available right now is around an hour or two of continuous riding. The average range is seven to ten miles on a single charge, and this is further influenced by the user weight and travel speed. As for the size of tires, it impacts the ease of use. Large wheels tend to get you a smoother ride. Other advantages include stability, a higher weight capacity, and the ability to navigate rough terrain. For hoverboards with smaller tires, the only advantage is that the smaller build might be more conducive for children to use. Other considerations such as weight capacity, other special features, and the price range are of secondary importance, though still essential if you’re looking for the best off-road hoverboards perfect for you.